Food Hunter's Guide to Cuisine: No Cookies Before Christmas! 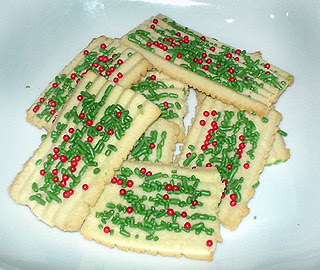 One of my earliest holiday memories is my mother as the "keeper" of the holiday cookies. Weeks before Christmas she would spend hours in the kitchen making dozens of treats only to squirrel them away until that special day. In our house no cookies were allowed to be eaten until Christmas Eve. My mother would store them in cookie tins that she would tape shut to ensure we couldn't get to them. To get around this I started helping her with the baking. This way I could sneak some cookies before they were stored away. Now I'm the primary cookie maker and I find it funny when my mom asks if she can try some cookies before Christmas. Here's the recipe for my mother's butter cookies. I'm submitting this to the Eat Christmas Cookies event sponsored by Foodblogga. Stay tuned for more cookies as they're baked. But remember there's no tasting them until Christmas. 1 cup sugar 3 tsp baking powder 2 eggs 1 tsp vanilla 4 tbs milk 1 cup butter Sprinkles for garnish 1. Preheat oven to 350 degrees. 2. In a mixer with a paddle attachment, add the sugar and the butter. Mix until light and fluffy. 3. Add the egg, vanilla and milk and mix to incorporate. 4. Sift together the baking powder and the flour. 5. Add the flour mixture to wet ingredients and mix until combined. 6. Using a cookie press, press cookies onto ungreased cookie sheets. 7. Top with the sprinkles of your choice. 8. Bake for 5 to 8 minutes, or until firm, but not yet browning.